Students can pick up a free goody bag packed full of the best alcohol free drinks for adults at Scotland’s first alcohol-free drinks festival in Glasgow next week1. 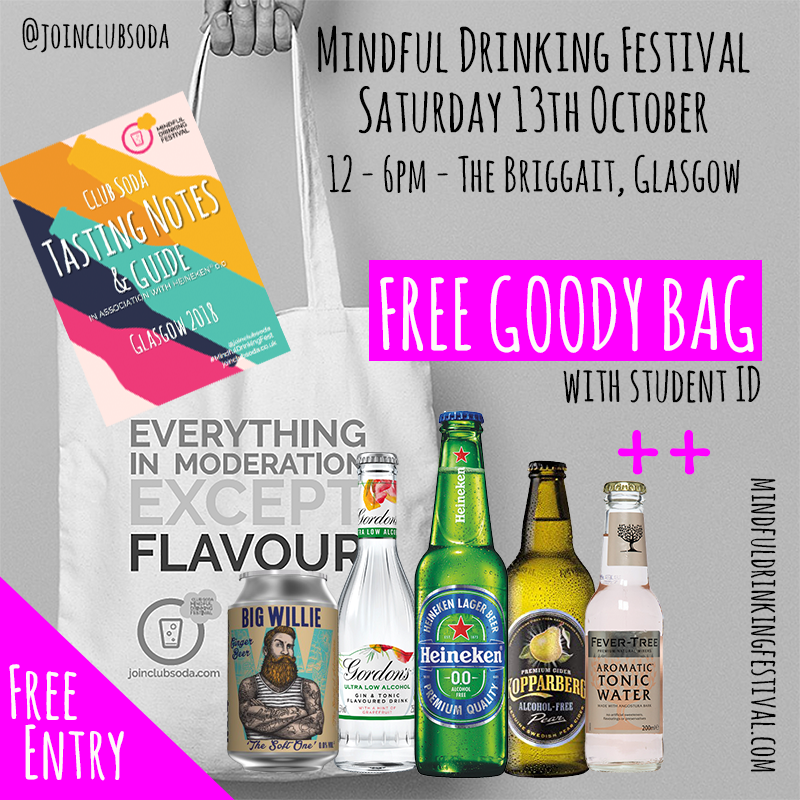 The festival, brought to Glasgow by mindful drinking movement Club Soda is the first of its kind in Scotland, and will appeal to students who don’t drink alcohol, are cutting down, or want to find alternatives on a night out. You will also have the chance to taste the new wave of alcohol-free drinks hitting the market, including alcohol free beers, spirits, and wine. There will be zero-proof cocktails made by some of the best bars in Glasgow as well as street food, live music, workshops and competitions – all for FREE. 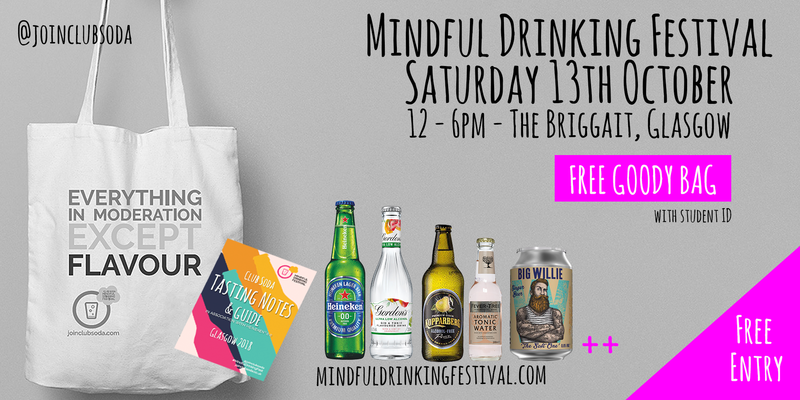 Students who come along to the festival will get a free goody bag packed full of drinks and goodies as well as being able to take part in free workshops, tastings, and cocktail making and beer pouring competitions. Student favourite Heineken® 0.0 has been leading the charge in the low and no alcohol beer category, driven by the great taste of their no-alcohol beer, and the fact it only has 69 calories per bottle. Heineken Global Master Brewer Willem van Waesberghe flying in from Amsterdam, is judging their 5 star pour pint pulling competition. Art exhibition about the history of the Glasgow pub. Club Soda co-founder Laura Willoughby MBE said:. “The festival is great for those going sugar-free, on a fitness regime, cutting back, not drinking for religious reason, or who are alcohol-free. There are many reasons why people may want to swap out a few alcoholic drinks for something a bit healthier. At the very least visiting the festival won’t do you any harm! We have been running alcohol-free pop-up bars for students across the country and know that not only are students drinking more mindfully than anyone else, but you are also up for trying new things. So our goody bag has the best alcohol-free drinks available in locally. We have brought together top brands to give you a taste of the best. Like Gordon’s Ultra Low, Heineken o.o and Kopparberg. On presentation of an NUS Card or student ID and subject to availability. Data from the Office for National Statistics last week confirmed that school-leavers were drinking and smoking less than their predecessors. Scotland is sober curious: Almost a fifth of UK drinkers say they are cutting down on their drinking – that’s over 650,000 people in Scotland (source: page 53 of the Drinkaware monitor 2017; 18% of the UK drinking population say they are changing their drinking habits right now). In the UK, sales of low and non-alcoholic beer grew by 20.5% over the 12 months to July 2017. A full press pack with everything you need for background, photos, facts and figures can be found here: https://mindfuldrinkingfestival.com/press and pictures can be found here and are free to use. Club Soda is a mindful drinking movement that helps people change their drinking, whether they want to do a sober sprint, drink more mindfully, or go alcohol-free. Visit joinclubsoda.co.uk – we are available for quotes, case studies, information and advice for your articles all year round.